Update: we've found a publicly available version of the paper, here. "The international tax system is in the midst of a contest between automatic information reporting and anonymous withholding models for ensuring that nations have the ability to tax offshore accounts. the contest . . . implicates broad questions about the future of tax sovereignty in a globalized economy and the treatment of the wealthiest vis-à-vis other taxpayers." 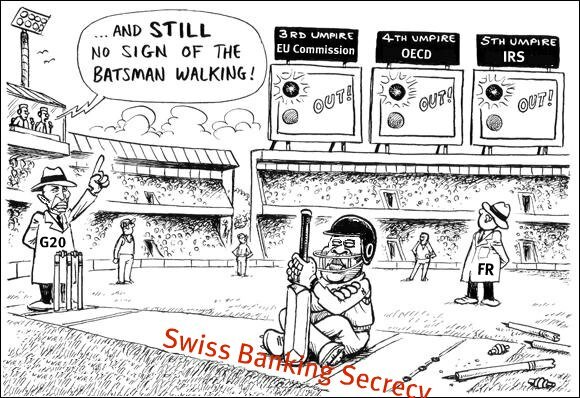 In one corner, we have the secrecy-steeped "withholding" model, led by Switzerland with its Rubik deals, where one jurisdiction withholds taxes on income (and occasionally on other things) but keeps the taxpayers' details secret. In the other corner is the potentially far more effective (and ethically far cleaner) model of automatic information exchange, which is the emerging global standard. In a sense, this is a battle between secrecy and transparency. Grinberg explains why the automatic reporting model is so superior to the Swiss model, and provide yet more reasons why the UK and German governments, and others, are so grievously mistaken to sign up to the Swiss subterfuge. (3) encouraging taxpayer engagement with the polity and supporting sovereign policy flexibility, especially in emerging and developing economies." "anonymous withholding exists to limit exchange of information, and thus such a regime runs counter to the extensive cross-border administrative assistance necessary to ferret out tax evasion on principal . . . automatic information reporting can be structured to both report on income and gains and to measure the growth of principal in a foreign account. Untaxed principal is a significant concern for tax administrators." Automatic information reporting also preserves tax morale, maintains the expressive values associated with the taxation of capital income, and supports government policy flexibility, particularly outside the large developed economies. Unlike anonymous withholding, an automatic information reporting solution has the capacity to develop into a broadly multilateral regime. Whereas anonymous withholding delegates the collection of tax to a foreign entity, automatic information reporting shores up a government’s capacity to tax its own citizens (TJN: in other words, the Swiss are saying 'trust us'. Read Tom Bowers' book Blood Money, then consider whether the Swiss 'trust me' approach should ever again be accepted in civilised society). Contrary to some conventional wisdom, anonymous withholding is not significantly cheaper, simpler, or more administrable than information reporting. These are all killer arguments against the Swiss model. We have been critical of the OECD's Global Forum, but we recognise that it is an institution of significant influence in the international tax arena. We therefore formally call on the Global Forum to to review the compatibility of the Swiss 'Rubik' agreements with the standard of effective exchange of information. We have also been critical of the Financial Action Task Force, but we recognise their influence too. We formally call on the FATF to assess whether the Rubik deals are consistent with the tax amnesty standards that they have set. We believe that in both cases the Swiss deals will be found wanting, and the UK, the original collaborator with Swiss secrecy, as well as Austria and Germany and others that may sign Rubik deals, could be shamed into changing their behaviour. "Four incongruent initiatives of the European Union, the OECD, Switzerland, and the United States together represent an emerging international regime in which financial institutions act to facilitate countries’ ability to tax their residents’ offshore accounts. The growing consensus that financial institutions should act as “tax intermediaries” cross-border represents a remarkable shift in international norms that has yet to be recognized in the literature. the emergence of the EU, OECD, Swiss, and U.S. approaches to cross-border tax administrative assistance has shifted the discourse of international tax cooperation from a dispute about whether financial institutions should function as cross-border tax intermediaries to a dispute about how financial institutions should perform that role." We have written plenty about this here, though we have not woven the strands together like this. The article ends by describing ways to help reconcile the emerging automatic information exchange approaches to produce an effective multilateral system. All in all, a highly valuable contribution to the literature. Cartoon, courtesy of Mark Morris.